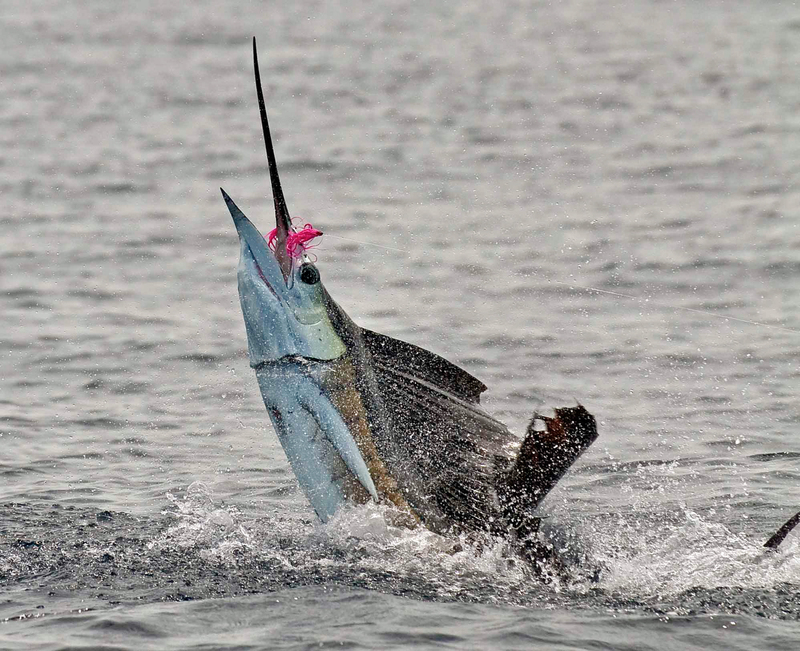 STEP BY STEP GUIDE for You to land a Sailfish on Fly!!! 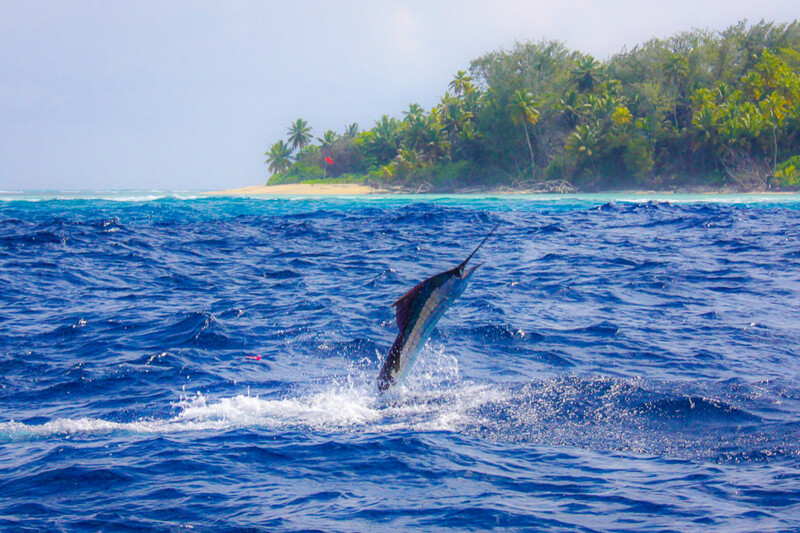 Over the years many methods have been hatched up to catch the Indo-Pacific Sailfish on fly fishing tackle. 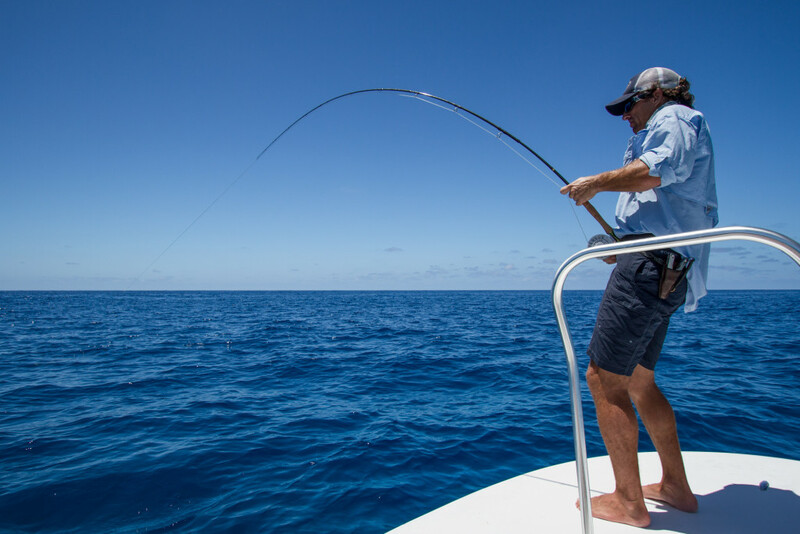 As a skipper I find that taking a back to basics route is by far the best way to target, hook and land a Sailfish. This will be your step-by-step guide covering everything from the tackle and techniques to the handling procedures. – by Bertrand Lablache. Before heading out to the water your fishing tackle will be the first thing you will have to make sure you have right. A 12 weight rod and large arbor reel will be called upon for this challenge, it is by far the best set up to use as its light enough to ensure you have the best fun, but also sturdy enough to ensure you reel in the fish properly without causing any unnecessary fatigue or strain. As a Sailfish will run a long way make sure you have plenty of backing on your reel, 300 meters of 80lb braid should be enough. When it comes to fly lines, the line you will have on your 12 weight rod for a GT or Tarpon will work well, add on some 130 pound test leader and that’s your tackle almost complete. Most fishing operations that target Sailfish on fly will have a host of homemade flies that have been tried and tested, however this shouldn’t discourage you from trying that fly that’s been sitting in your box for 2 years waiting for the trip, but ideally the hook should be a tandem 8/0. Tackle is just half the fun, with these fish being sometimes extremely fussy on how and what they eat, actually getting the fish to eat the fly with more commitment than they show up with is the challenge. When on the boat the skipper and deckhand will sort out most of the stuff for you, so you need not worry about teasers and strip bait, but as it’s always nice to know what is going to happen ahead of time here’s what you need to know. 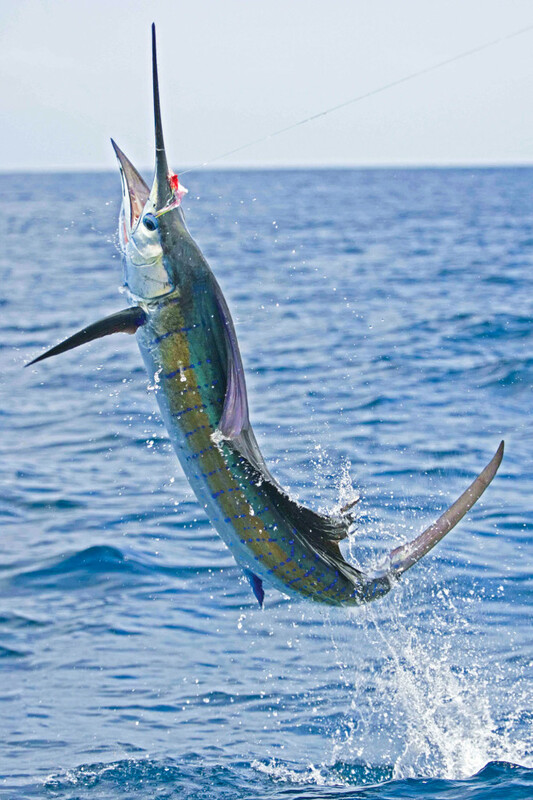 When teasing for sailfish on fly you will need some hook less lures that are most commonly called teasers. I myself like to use 400 pound test wire that has a medium sized loop crimped in at the bottom and a normal loop at the top for attaching to either your bridge reels or your normal conventional rod and reel setup. If crimping isn’t for you then some 150-pound test leader with a medium sized perfection loop at the bottom and normal sized one at the top will also do the trick. These teasers will work quite well by themselves but will work even better if you place piece of strip bait through the loop of the bottom end so it sits inside the lure. This will be tied down lightly with some copper wire. Number of teasers is the subject that has been debated over many a drink. I find that not overdoing it is sometimes the best way to go with these fish, so a one teaser per crew member rule works best. That way if one or more fish are raised you do not have a teaser unattended, which could mean the difference between a double up or a teaser getting tangled as your fish takes off. Once on the boat and the crew has put the teasers out, you will have to get your fly rod ready for the fight it’s about to go through. Place your fly in the water and strip out line so your fly sits just behind the teaser closest to the boat, now strip in your line making sure its not caught or tangled around anything. Place your fly on the side of the boat and the rod in a position so it is out of the way but at the same time easily accessible. 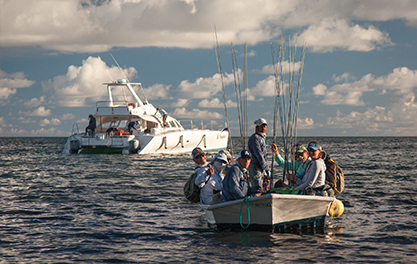 Drag is an important feature in how well your venture goes, as it will dictate whether the fish stays on or not. Setting your drag is simple, the method I’ve found works the best is setting your drag so that you can pull out line but with minimal strength needed, then turn it up one and a half full turns. This will give you the best fight but also stop you from fighting a fish for three hours. Once a fish has been raised and is at the teaser the skipper will let you know and you will be there with rod in one hand and your fly in the other, making sure you have no tangles as you wait for the command to drop your fly in. Once that fish is up on a teaser the crew will rush to the rods, reeling in at a fast pace to keep the fish interested and hungry, while the other teasers are cleared out the water. The fish will 9 times out of 10 follow the teaser right up to the boat and stick around once all teasers have been pulled out the water. This will be the time for you to drop the fly in the water and let your line out, holding your line at the first guide from the reel you make one large strip past your body making sure not to let go of the line and then follow it back to that first guide. The reason for this is most of the time the fish will try to grab the fly at the exact moment you let go of the line and that’s when the scrambling happens and we’re left with out rods in our hands. You will see the fish move to your fly after a couple of powerful strips, regardless of how much you want to try and set the hook at that point, please fight the urge. The fish, once it has fully committed will grab your fly and turn on its side, that is the time for the set, with your hand still on the line at the first guide (I told you this would come in handy), make a sturdy set, do not hold back as these fish have quite hard mouths and setting the hook is usually where the fish is lost. Once hooked up its important to remember not to lift your rod, regardless of how hard that fish is fighting. When fighting the fish I find moving your rod from side to side to gain some line is the easiest way of doing it, not only will this reduce the chance of pulling the hook but the tugging itself will surely prompt the fish into some majestic jumps and make no mistake they are photogenic fish. The fight will typically last 30-40 minutes but the fish will eventually tire. Once at the boat the deckhand will grab the fish’s bill with a gloved hand. 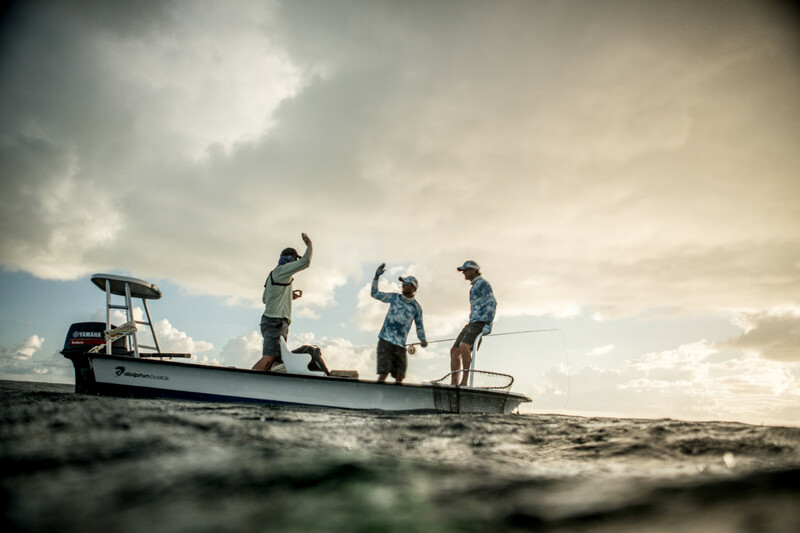 If it’s your first Sailfish on fly you are probably going to want a picture so when the cameras are ready the crew will aid in getting a few quick clips of the fish next to the boat. The lactic acid build up that the fish suffers during the fight means that it is important to swim the fish for several minutes in order to revive it properly before it is released. Once the Sailfish swims away again and your adrenaline has stopped pumping quite so hard you can stop and reflect on your achievement.